My patio vegetable patch has been yielding some lovely cucumbers and plum tomatoes this week. These are great for snacking, but I occasionally toss them into a bowl for a salad. 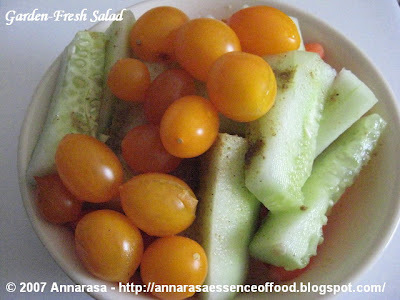 The salad here is a simple salad, but it packs a great punch when accompanied with a nice heavy desi-style lunch. Alternately pair it with Spicy Paneer-Filled Rolls or a Pilaf for a complete meal! Toss all the vegetables in a large mixing bowl. In a small bowl, mix the salt, black pepper, cumin into the lemon juice. Pour over the vegetables so as to coat them evenly. This Garden-Fresh Salad goes to WYF Soups/Starters/Salad hosted by Easy Crafts. It also goes to Grow Your Own # 17 hosted this fortnight by Denise at Chez Us. Somehow, anything cooked with what you grow always tastes sweeter. Hope your hand id much better now. having a garden has a lot of advtges and eating fresh is one among them. great salad! This looks so light and flavorful, a great snack. Your tomatoes are such a pretty color! An Injury, a Tag, and a Time to Give Thanks!